October 14, 2017 By This post may contain affiliate links. Read my disclosure policy here. 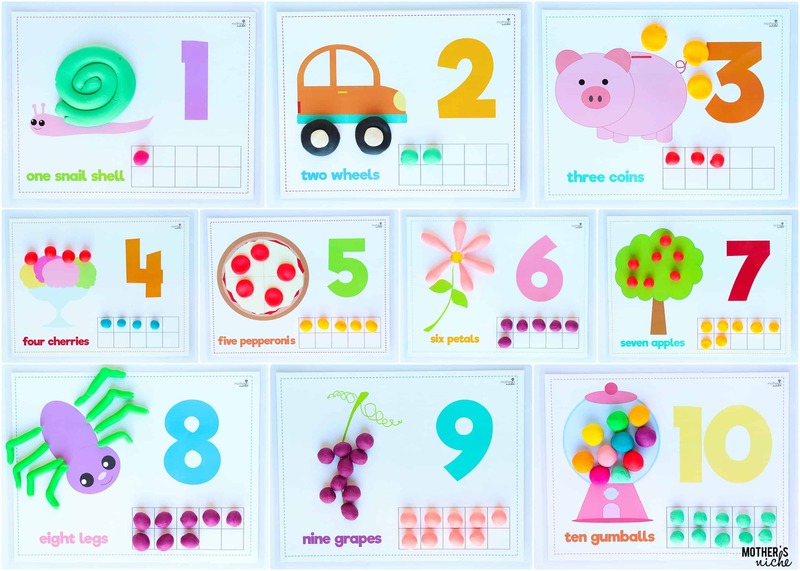 Counting play dough activity games to teach motor skills for molding shapes creatively learning colors, numbers, and of course how to count. This is an instant Download via email. Kids are busy, aren’t they?! It’s important to slow them down with activities that don’t include a screen — at least I feel strongly about that. These play dough mats do exactly that for my kids. These play dough mats include activities and challenges that really engage a child and it’s a great way for a parent to teach and play with their kids! Perfect for keeping those little ones entertained at church, in the doctor’s office, traveling in the car, or just at home–you name it! This is for the PDF printable file only, not the actual book. No part of this PDF file may be reproduced in any media format to be resold. It is for personal use only. Message me for bulk order discounts (preschool, church groups, boys or girls groups, etc.). This PDF is an INSTANT DOWNLOAD that you’ll receive via email.